Let customers purchase gift cards and send them to friends via post office or email. Easily keep track of all purchased certificates and enable visitors to customize your Magento gift cards according to their needs. 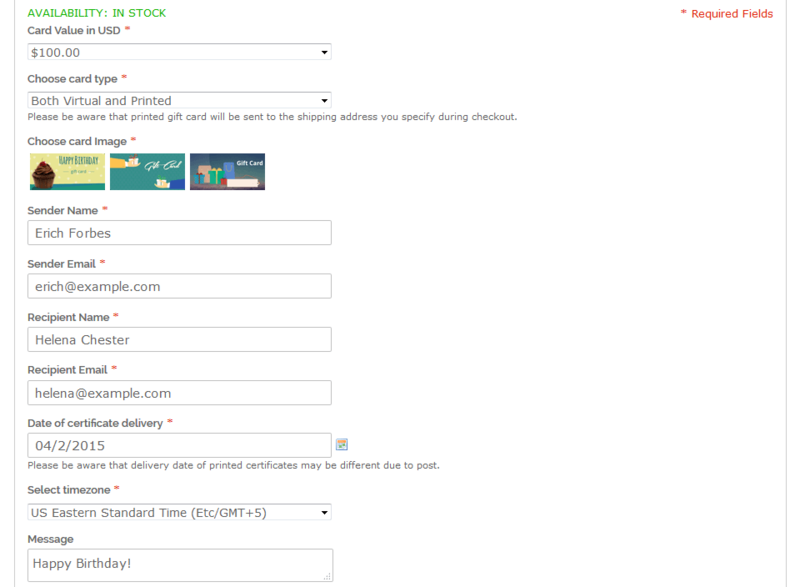 Gift card products on a category page. 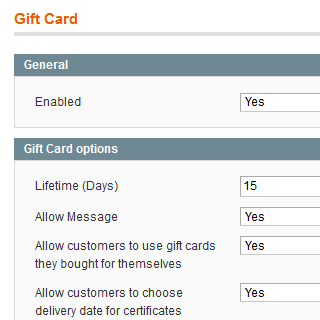 With the Magento 1 Gift Card extension customers will be able to solve the gifting problem once and for all by purchasing specially designed gift certificates and sending them to friends and relatives either via email or via post office. Once the gift certificate is bought, a unique gift code with a greeting message will be sent to the recipient. The module works both for authorized users and guest visitors. E-gifting is rightly considered to be one of the most effective sales boosters. According to the Internetretailer.com about 80 percent of costumers say they buy at least one gift certificate during the holiday shopping season. Apart from that, more than 60 percent of gift voucher holders spend more than the amount of their gift card. 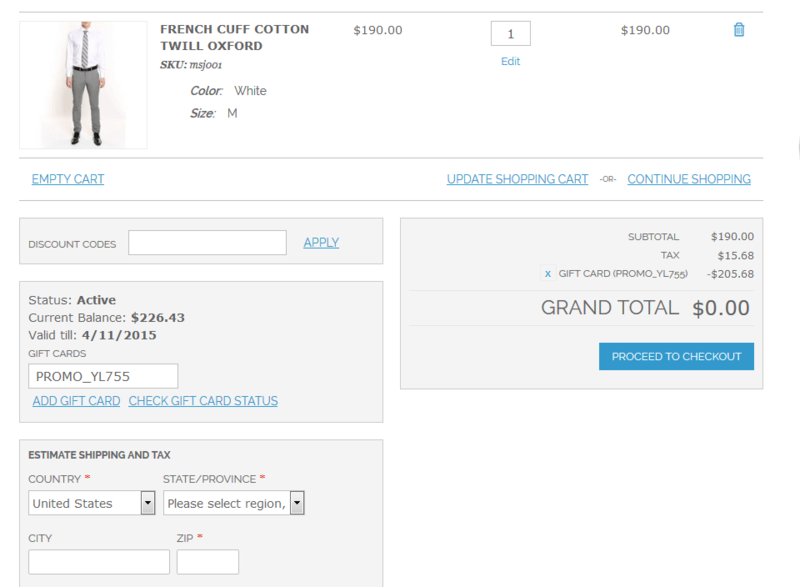 All specified gift card details will be automatically displayed on the shopping cart page. 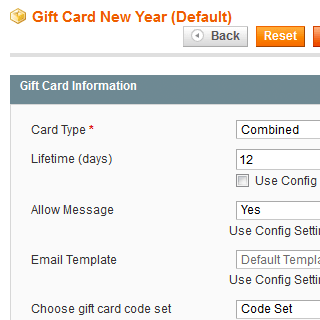 As soon as a Magento gift voucher recipient gets a gift code via email or post office and inserts it in a special Magento gift card field, the card balance will be available on a customer account page in the Gift Card tab. 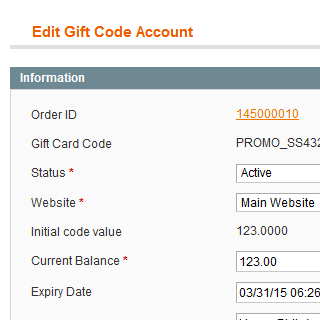 To apply an active Magento gift card code on the shopping cart page customers just need to insert the code in a special field and click on the 'Add gift card' link below. Once the code is applied the new grand total price will be automatically recalculated and displayed. Specify when the expiration notification should be sent. Find the latest best gift cards practices here. 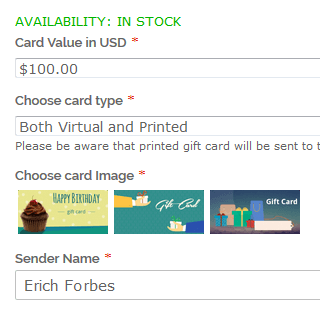 Create various pricing types for each particular gift card product. You can set either fixed amounts or let customers specify their own custom certificate value. 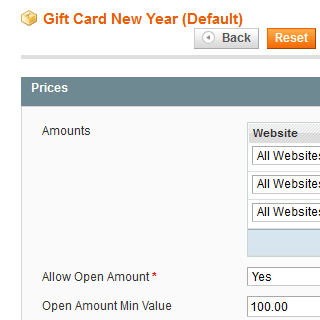 Moreover, flexible extension settings enable you to specify whether the Magento gift certicate price will be equal to the whole cart amount or to a specific percent from the card value. 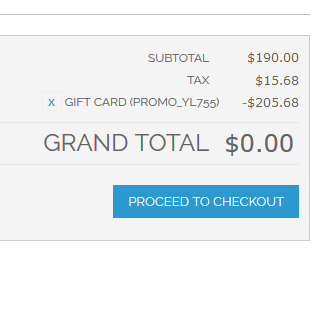 See here how to turn gift cards to a conversion rate optimizer. Magento gift voucher extension enables you to choose from 3 card types: printed (the card will be sent via post office), virtual (the card will be sent via email) or combined type, that includes both printed and virtual variants. You can also easily fine-tune other module settings according to your store specifics and choose which options will be available to customers on the frontend. 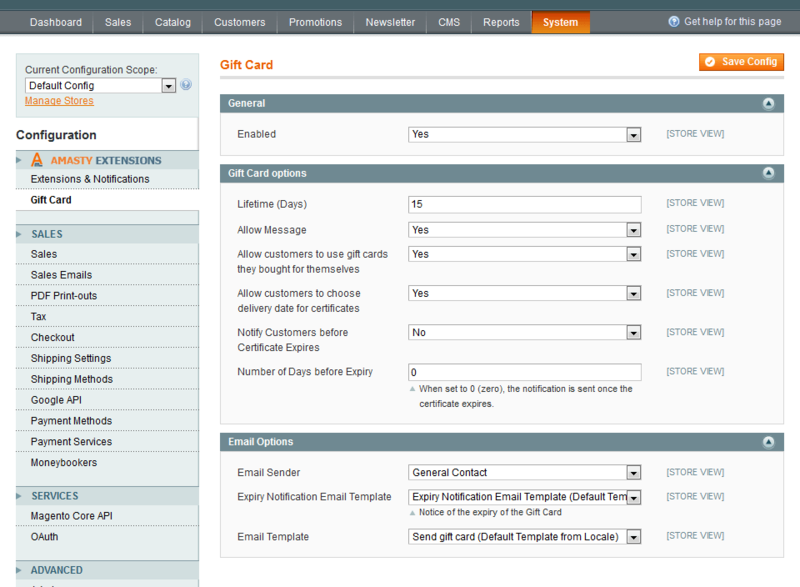 With the Gift Card extension you can generate as many gift codes as you need just in a few clicks. 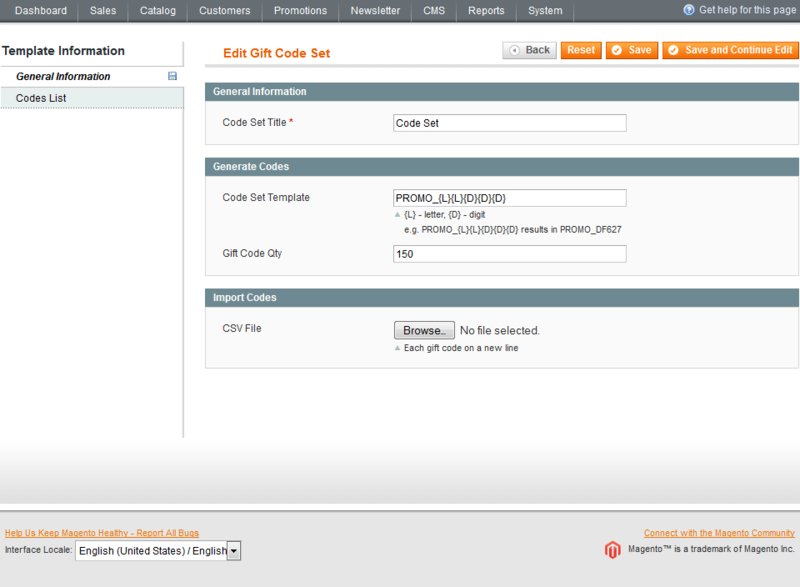 You can also easily import codes in CSV format simply specifying each code in a new line. 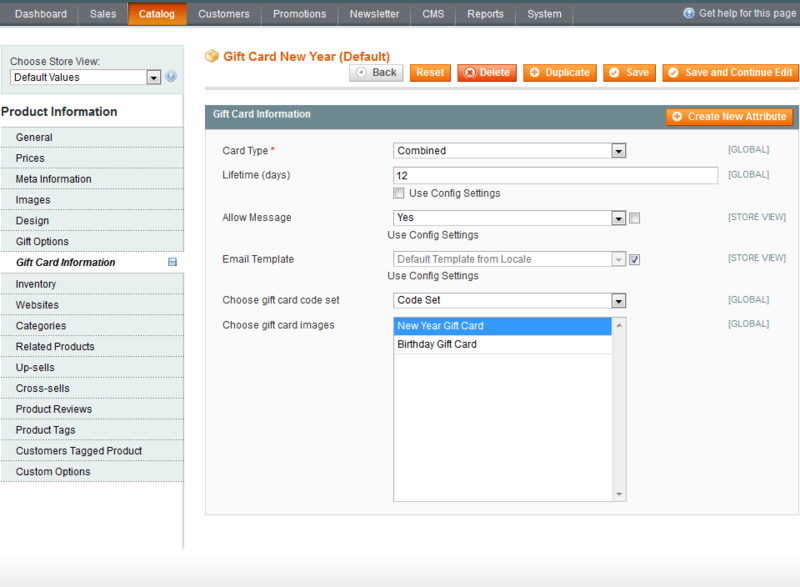 The Gift Card Magento module offers an effective codes management tool. All purchased gift codes are carefully placed to a special grid where you can delete unnecessary codes or change any code settings if needed. Here you can also view the history of a code usage that includes: store view where the code was bought, the date of code purchase as well as the information about orders made with a particular code. 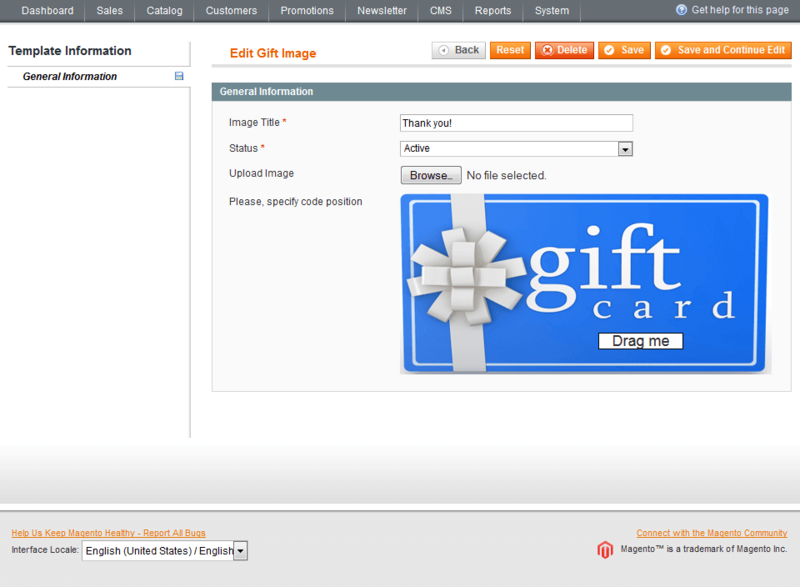 Impress store visitors with a rich selection of Magento gift certificates images. 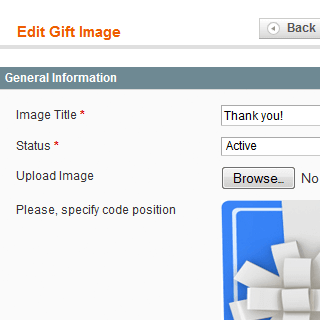 Easily upload an unlimited number of gift pictures to your admin panel so that everyone could choose an appropriate image to present it to friends with 'Happy Birthday', 'Merry Christmas' or any other message. Check our free packs of labels and cards to enhance your web store visual presentation. Offer your customers to wrap their gifts them to receivers with greeting cards. 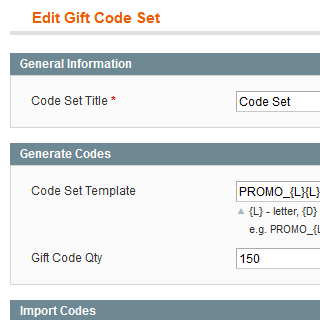 Use Magento Gift Wrap to add this feature. 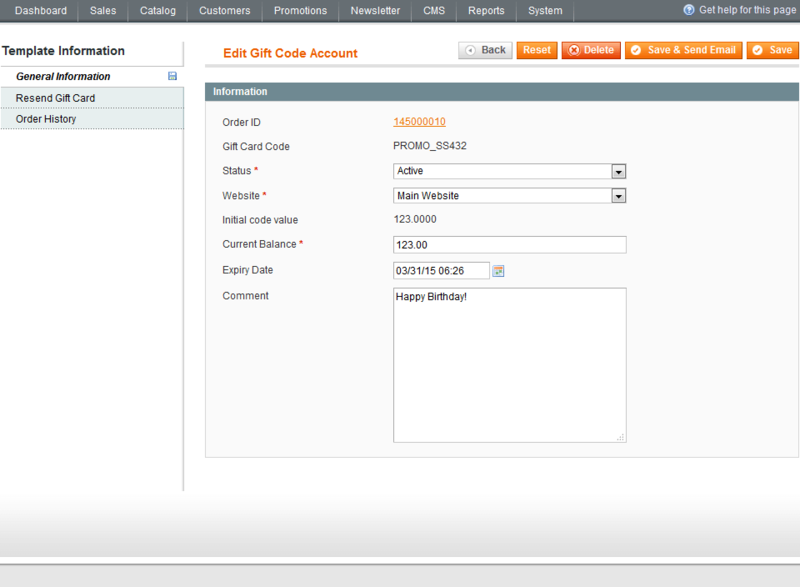 You can also enable your clients to create gift registries for different occasions: birthday, wedding, etc. Use Magento Gift Registry for this. The module is good en very useful. We have some problem with the setup but the support was very fast and fixed the problem. It does what it promises and the support is unbeatable. Thank you!!! Not a big fun of the logic which is used to sell the gift cards, but eventually it works. The purchase process simplification would really help. Nevertheless, it works fine for now. English speaking support is friendly. Like other Amasty extension the installation and configuration went fine; I had a small issue caused by our customized checkout but Amasty support immediatly fixed that. Awesome! I really recommend this extension. Great module in case you use everything just out of the box, but if you need to make any changes on the product page where the customer purchase a gift card, you need to know html to display it in the way you like. Our clients were pushing us to implement something like gift cards for quite some time. They just demanded such cards. Now when the module is working, customers comment very positively on both giftcards and the variety of shopping opportunities that such cards allow. We didn't face any installation issues and the configuration was also pleasant. The number of options and settings is amazing. With this plugin you can create really unique cards and loyalty programs. The only weak spot is that the plugin is not documented too well; you’ll have to mess with the module for some time before you can understand how it all works. 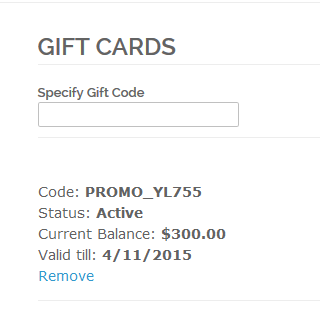 Gift Card is a very reliable module and a great business solution. Often customers search for gift cards to present to their family or friends, and shop owners really should provide this option. This plugin from Amasty is one of a few that offers sending cards by post, it turned out to be a valuable feature. We didn’t run into any serious issues during the installation process, we managed to figure all the questions just by reading the docs carefully. I’m giving 4 stars now to save one for later. This module is new and I hope that updates would make it even better. We’ve implemented this module just recently, and I can already see that it’s a valuable tool; it’s useful and has rich functionalirty. Numerous features of this product actually make it a “must have” for any store. We are selling cosmetics, and I admit we should have implemented gift cards long ago. We noticed that customers purchase cards almost as readily, as actual products. The plugin is very easy to install and to configure, the code is good. It didn’t cause any problems with our custom theme or other extensions. We almost got accustomed that implementing new tools is painful. This time was a pleasant surprise. Devs there really know what merchants need and how to do it! Every time I install new extension on my magento store I get really nervous. The modules always seem to be useful when you read what developers say in the description but in real life plugins often conflict with each other, especially if they come from different developer. That is exactly what happened to me this time. I submitted a ticket to support. They asked me for credentials to my server and did something there on the backend. After 2 days of work the module finally works as expected, I’ll see if the outcome would be worth all this trouble. 3 stars ‘cause I don’t like third party teams messing on my website. And I just really want the tools to work at once, without extra trouble. The extension works just as it should. The possibility to make combined cards is a very nice feature. For us it actually means that customer can easily make purchases either in our webstore or in offline shops, which is good all-round. The process of creating customized cards (with unique images and messages) is plain simple, and the outcome is really impressive. Such gift cards can really add points to the individuality of your brand. While the plugin itself is incredibly good, the support is second to none. I needed some expert advice and a small customization. The techs had everything done within just several hours. They are professional, friendly and experienced. This module is absolutely worth every dollar! First of all thanks Amasty for your support, especially Ivan has given me dedicated support for some bug fixes related with my theme. The only lack of the extension is, not having VAT seperately. I will be solving this problem by hiring Amasty sources (because it's not described in the demo) but should be added for the next updates. Thanks again, it works very well. Good extension with nice functionality. We weren’t planning to implement this tool but when this vendor released the extensions we decided to tr y. The code is clean, no conflicts with extensions from other providers. Gift cards have long been among top requests from my customers and I finally decided to add them. 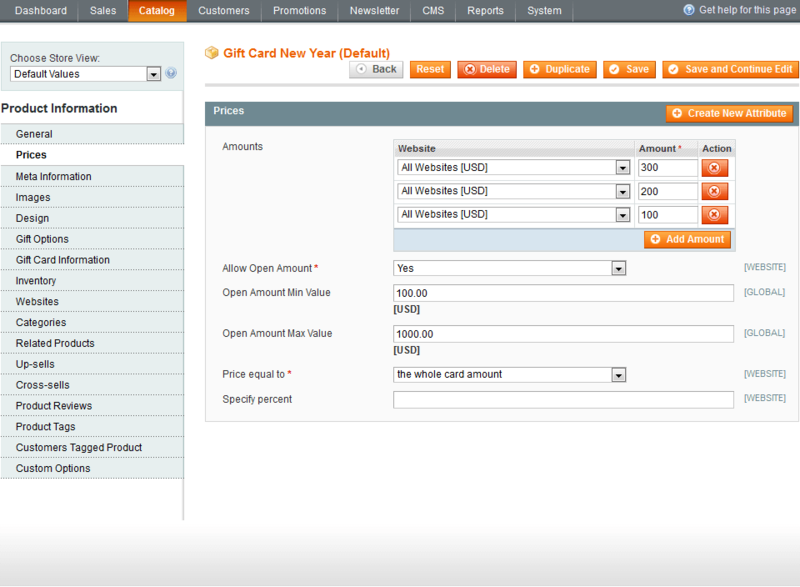 I'm fully happy with the features and see that a lof of people buy gift cards, especially during holidays. About the extension itself: the installation is ok and settings are intuitive. The only thing I would like to see in the next updates is the ability to upload custom pictures by clients. That would be awesome. 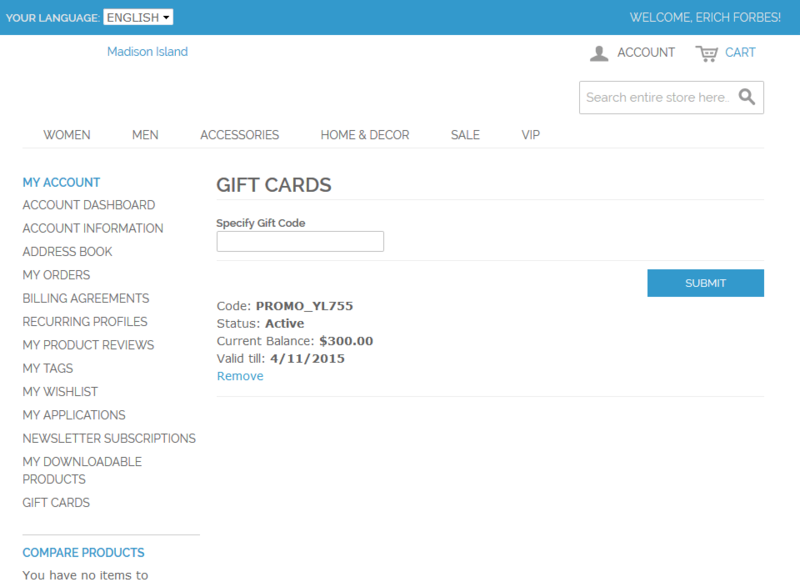 – Add config "Product Types, Which Can Be Bought With Gift Card"